The CityLab programme, coordinated by researcher Warren Smit, facilitates the co-production of policy-relevant knowledge related to urban poverty and the ways in which it is experienced in the greater Cape Town city region. The CityLab programme is ACC’s main research programme on the Cape Town city region. It facilitates the co-production of policy-relevant knowledge to reduce urban poverty, through the engagement of researchers, government officials and civil society. The CityLab programme was initiated during 2008, and has been funded by a pool of donors including the City of Cape Town, the Western Cape Provincial Government, the University of Cape Town and various private sector funders. The CityLab programme also forms part of the Mistra Urban Futures Cape Town Local Interaction Platform and has been funded by the Mistra Foundation and Swedish International Development Cooperation Agency. The CityLab programme is organised around a number of key themes, each of which has a lifespan of a few years. Over the lifecycle of each CityLab theme there are meetings and seminars to stimulate engagement between officials, researchers, policymakers and practitioners around key topics, new research on that theme is directly undertaken or facilitated, and, ultimately, there is the production of a major publication (for example, a book or special issue of a journal) on that particular theme in Cape Town. There have been nine CityLabs so far, three of which are still on-going. 1. Healthy Cities CityLab, co-ordinated by Warren Smit: this CityLab deals with the relationship between the physical urban environment and human health and wellbeing in Cape Town, and how the burden of disease can be reduced through the creation of healthier urban environments. 2. Urban Violence, Safety and Governance CityLab, co-ordinated by Mercy Brown-Luthango: this CityLab engages with issues of violence and upgrading in Cape Town. 3. Sustainable Human Settlements CityLab, co-ordinated by Liza Cirolia: this CityLab, in partnership with the Western Cape Department of Human Settlements, explores key aspects of housing policy and delivery. 1. 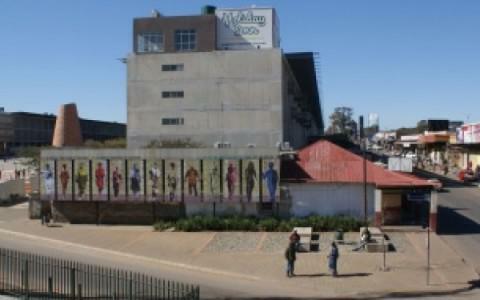 Central CityLab: This focused on the Cape Town CBD and adjacent areas. Issues such as urban regeneration, densification and inclusivity are important in this area, which is of crucial importance to the broader Cape Town city-region. 2. Philippi CityLab: Philippi is a relatively well-located area of the Cape Flats with a concentration of dense informal settlements, considerable government investment in housing and facilities, and large amounts of vacant developable land. It is a highly contested environment where many of the substantive challenges of integrated human settlements emerge. 3. Climate Change CityLab: This CityLab engaged with issues of climate change adaptation and mitigation in the Cape Town city region, mainly through a formal partnership with the City of Cape Town on the Climate Change Think Tank. 4. Urban Flooding CityLab: Flooding of informal settlements is a particularly big problem in Cape Town, and gives rise to a number of issues regarding risk reduction and water governance in Cape Town. This CityLab focused on understanding the causes and impacts of flooding of informal settlements and how flooding risks can be reduced. 5. Urban Ecology CityLab: This CityLab dealt with the interface between the urban environment and the natural environment in Cape Town. The focus of this CityLab spoke most directly to the theoretical literatures of ecosystem services, multifunctional landscapes, conservation, and restoration. 6. Public Culture CityLab: this CityLab focused on the impacts of public art in public spaces in Cape Town. The CityLabs have provided platforms for engagement between practitioners and researchers, which has enriched the perspectives of both. Through the CityLab programmes, the production of new research material on Cape Town has been stimulated, both through the research of the CityLab researchers and through the research of ACC associates. Urban mobility: how will we move in the future city? Jannette Sadik-Khan, as Transport Commissioner for New York City is responsible for the operation and maintenance of 6,000 miles of streets and highways, nearly 800 bridges, 1.3 million street signs, 300,000 streetlights and 12,000 signalized intersections. This volume of the Delft School of Design Series focuses on particular urban questions related to the South African urban context. The book seeks to construct a contemporary critical dialogue of current spatial practises and contemporary design instruments in relation to social, political and governance structures through an architectural and urban lens. “The African Centre for Cities recently launched a new CityLab on “Urban Violence, Safety and Governance”. Led by Dr Mercy Luthango-Brown, this CityLab will look at the effectiveness of upgrading informal settlements as a response to violence and the improvement of safety within settlements.